Honeysuckle: a plant for all seasons? Maybe not quite, although honeysuckle is one of the first plants in southern England to show fresh new growth each year, often as early as late December or January, amidst winter snow and frost, in a welcome reminder that spring is not too far away. Honeysuckle flowers, however, do not appear until May or June, and may continue to bloom until September, but they are certainly worth the wait. Long-tubed, white inside but otherwise yellowish-cream tinged with lilac or red, they eventually take on hues of orange-buff. The upper lip is four-lobed, whilst the lower lip has been described as tongue-like. The stamens noticeably extend beyond the mouth of the flower. Ever richly scented, the flowers’ deliciously sweet aroma led Samuel Pepys in the 17th century to refer to ‘the trumpet flower’ whose bugles ‘blow scent instead of sound’. They are visited by a range of day flying pollinating insects, but night flyers, such as long-tongued moths, are clearly important, too, for as darkness falls, the strength of the flowers' scent noticeably increases in a determined attempt to attract passing insects. 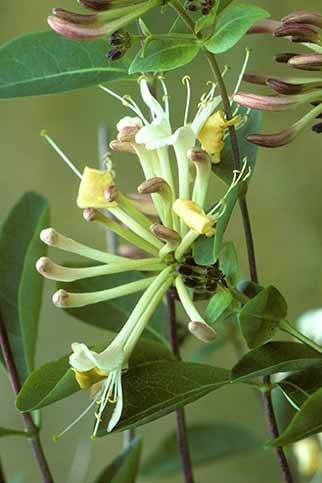 A number of the honeysuckle’s many country names - woodbine, woodbind, bind, bindweed - refer to its climbing lifestyle, using for support the trunks and branches of shrubs and saplings as it twists ever upwards. Indeed, so tight is the grip of this deciduous, woody, clockwise climber that Geoffrey Grigson noted in The Englishman’s Flora: ‘Woodbine, honeysuckle, hugs more like a killing snake than a friend, often squeezing saplings into a spiral’, which results in a barley-sugar-like appearance that can frequently be observed in the New Forest. Honeysuckle can be found in many of the local broad-leaved inclosures and in some of the ancient, unenclosed woodlands, although it is rarely abundantly present, for the plant is avidly taken by deer and commoners’ stock – both ponies and cattle. What survives, however, is of considerable importance to the ecology of the woods, for honeysuckle is the sole caterpillar food plant of the strikingly impressive White Admiral butterfly, and the plant's bright red berries are avidly taken by a range of birds.